If you’d like to catch a kabuki performance while in Tokyo, it’s actually pretty easy to do, especially if you’re happy with just one act of a performance. Here are all the details. A kabuki performance is like watching an alien stage show from another galaxy. The entire thing is otherworldly – from the bizarre vocal style to the flamboyant costumes. Kabuki is truly an “only in Japan” experience. Full kabuki dramas last up to several hours and they’re probably way too much for anyone but die-hard fans. 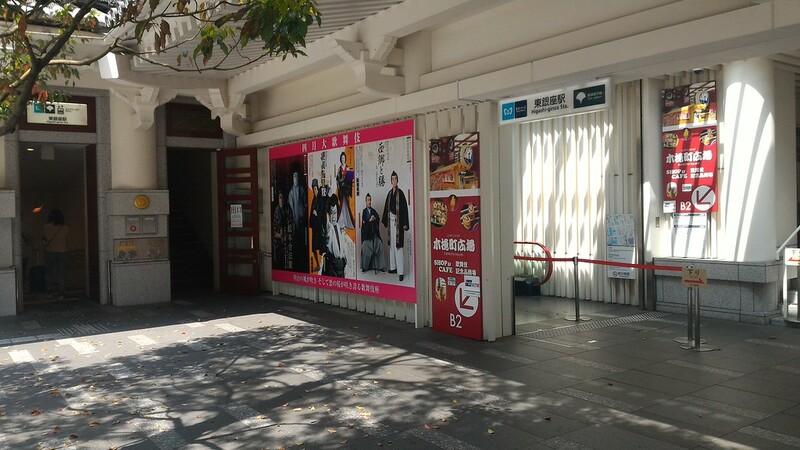 But, if you’d like to just get a taste of kabuki, there’s a great option for tourists: You can catch just one act (known as “hitomakumi” in Japanese). And, there’s no need to buy tickets in advance: You can just show up at the venue and buy one-act tickets. Tokyo’s main kabuki venue is Kabukiza Theatre, which is located in Ginza. It’s directly connected Higashi-Ginza subway station. Before going, check the schedule of upcoming shows on the Kabukiza English web page to make sure there is a show on when you are in town. 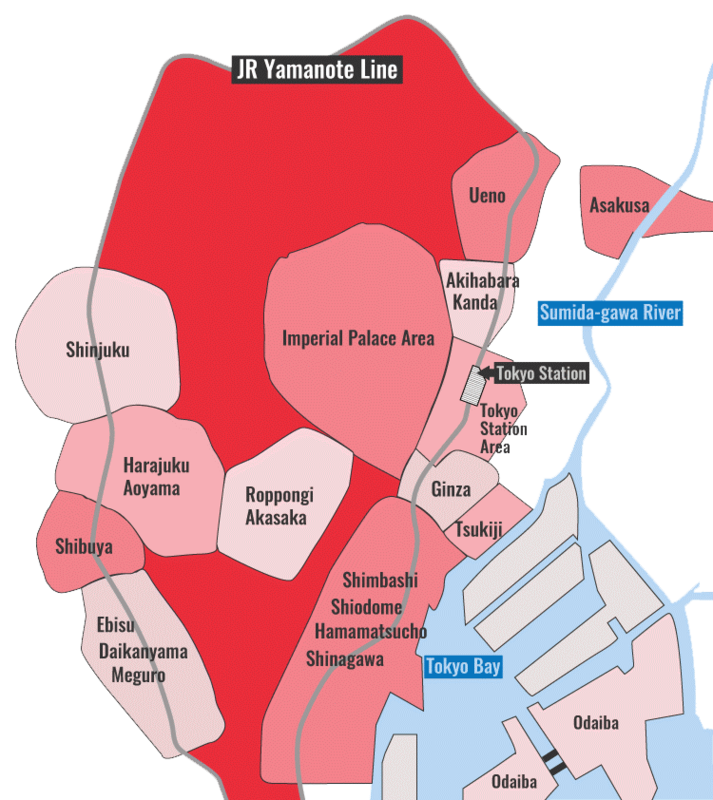 After checking the schedule (see above) to determine that there is a show on, head to Higashi-Ginza subway station, which is on the Hibiya and Asakusa subway lines. Follow the signs for exit #3, which is directly below the theatre. Get up to street level and walk to the front of the theatre. On the left side of the building, you will see a red bench and a line of people waiting to buy tickets. This is the line for one-act tickets. 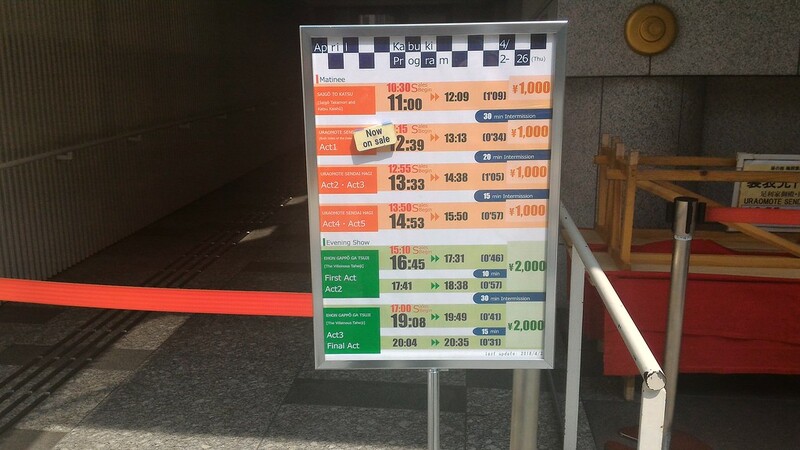 There will be a sign near the line that shows the day’s schedule and which tickets are currently on sale. One-act tickets for daytime shows usually cost Y1,000 and one-act tickets for evening shows usually cost Y2,000. There are usually attendants on hand who speak enough English to explain things. 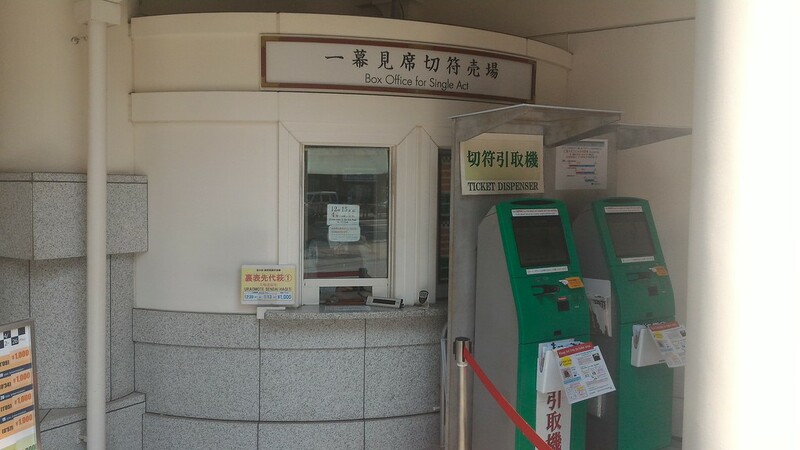 You may have to wait a few minutes before being able to approach the ticket window to buy your ticket(s). 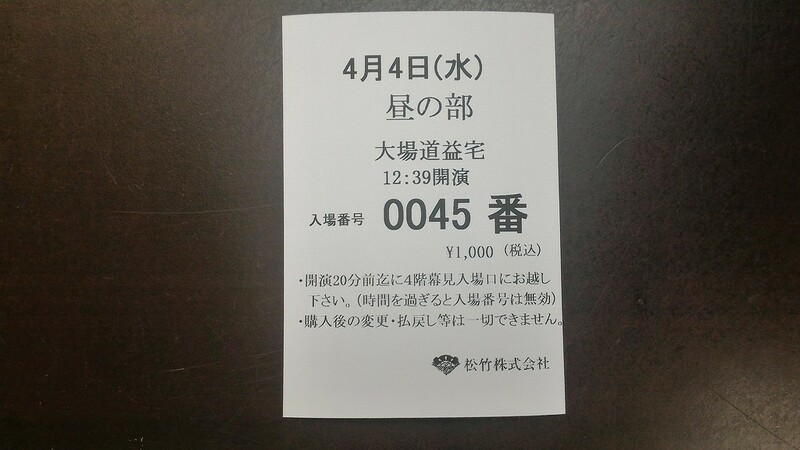 The actual one-act ticket will be written only in Japanese, but you will be able to read the time that the act begins, which is written clearly in numbers. As the instructions on the ticket state (in Japanese), you should enter the hall about 20 minutes before the curtain goes on, so get there about 20 minutes before the time printed on your ticket. When you enter the theatre, you will be directed to the elevator that takes you up to the 4th floor, which is where the one-act ticket holders sit (or stand). The seats in this section are unreserved, so that you can sit in any open seat. The seats are pretty cramped and you’ll be crammed right up against whoever is next to you. If the seats are full or you just want a little more personal space, you are allowed to stand. Note that phone use and photography are prohibited during the show. 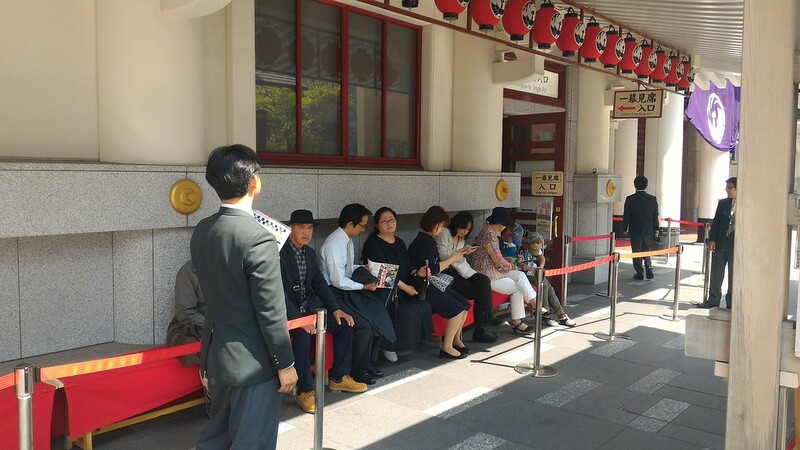 If you’d like to sit closer to the action or want to buy advance tickets for a performance at Kabukiza, it’s also quite easy to do. Just head to Kabukiza and take the escalator down to the basement level (the sign above the escalator indicates Higashi-Ginza subway station). At the bottom of the escalator make a U-turn to the right and you will see the Kabukiza Ticket Office, which is marked in Japanese and English. The ladies here usually speak enough to help you select a show and your seats. If you’re heading to Kyoto and want to see kabuki there, check the Kyoto Minamiza Kabuki Theatre English webpage. For historical details of kabuki and more on the experience of seeing a kabuki performance, see Kabuki at Kyoto’s Minamiza Theatre.